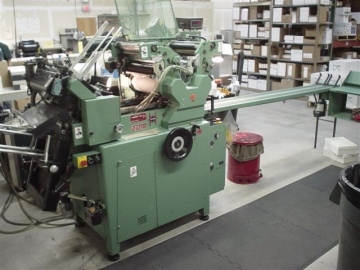 The Halm Super Jet two color envelope press provides high speed envelope printing. The most reliable and versatile envelope press available. Prints one side at speeds up to 60,000 impressions per hour and perfects at speeds of up to 30,000 impressions per hour. Maximum imprint area 12 x 18. Four sided bleed capabilities up to 9 x 12. The addition of this press makes Zuna Corporation the most competitive source for printed envelopes.